Specializing in Toyota Lexus Sciont Honda Acura Hyundai & Kia makes us more efficient & more competitive, which allows us to sell our products for less. 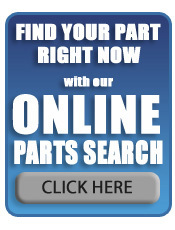 Your parts department spends much less time looking for used parts because they are talking to a sales staff that knows the product as well as they do. We pull and inventory an average of 200 parts per vehicle. From door handles to engines, our inventory is fully computerized. We have the best standard warranty in the industry! 100 Day, 1 year, 2 year 3 year and an optional 3 year parts & Labor warranty. 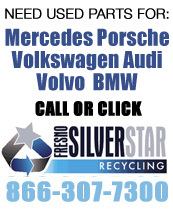 Using used parts lowers the cost per vehicle in your used car department. California RUST FREE body parts. 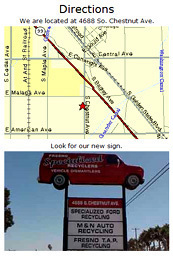 We can fill any order from body parts to engines. THIS WARRANTY IS ON THE BACK OF ALL INVOICES. LABOR COST ARE NOT COVERED BY WARRANTY, UNLESS PURCHASED SEPERATLY! 1. All rebuildable vehicles and body parts are sold on "as is" basis. 2. Without exception the seller will not pay any amount to the repair of parts to buyer, nor will seller pay the labor cost incurred by buyer in removing, replacing or repairing parts sold. a. No refund on electrical parts. b. No refund on smog parts. c. Merchandise purchased and returned on a "not needed" basis is subject to a 25% restocking fee. d. Deposits are not refundable on "special order items". 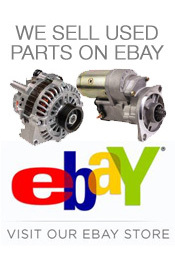 E All returned parts must be accompanied by the original invoice. f. No refunds on Freight. 4. All open accounts are due and payable on the tenth (10th) day of the month following date of purchase. A carrying charge of 1-1/2 % per month (18% annum) payable from the tenth day of the month following the date of purchase will be added to the balance of each account not paid by the twentieth (20th) of the month following date of purchase. Buyer agrees in collecting amounts due on past due accounts. 5. Seller disclaims all warranties (whether arising from Section 2312 (1) of the California Commercial Code, from expressions of seller , by implication or from the common law of title or right to transfer the goods; or that buyer's possession of the goods will not be disturbed. Seller assumes no responsibility for defending whatever is conveyed. 6. Because the conditions of use are beyond our control, seller assumes no obligation or liability for the performance of these articles. you must establish yourself whether these articles are suitabe for your use. 7. All used merchandise must be inspected by buyer for defects or safety hazards. Seller states that he in no way garantees or warrants used merchandize for apparent or nonapparent safety hazards and affirmatively states that used merchandise sold may have safety hazards, and it is the responsibility of the buyer to inspect for actual or latent safety hazards or hire an expert to so inspect. 8. Buyer afffirms that before he entered into this agreement, the seller requested that he examine the goods to ascertain whether there were any defects in the goods which would make them unacceptable to mim, that the seller afforded to buyer an adequate opportunity to make such examination before he entered into this agreement and that he has examined the goods as fully as he desires for the purpose of determining whether there are defects. 9. The warranty does not apply if parts are broken or taken apart by customer, or if motors and / or transmissions are not installed by a registered repair facility, except for this limited warranty such used parts are sold "As Is" with all faults. There are no other express warranties and no implied warranties including the warranty and merchantability. 10. Warranties posted for your inspection. 10. Warranty does not include freight cost. 10. In store credits are good for one year from original issue date.